Cold Fusion coming next year? Really? Dude, … I like ya but …. whatever you’re smoking I’d like some. Nice designs though. 1MW units are already for sale. Defkalion says they’ll have Hyperion household units that meet European standards this coming year. It looks like it’s from the future ! There are large closets on the end of each bedroom. The interior yard really appeals. What kind of materials would someone use in order to keep it at $10.00 / sq.ft. Please help me with the type of materials. First of all, you want to start out with something small and simple like a tool shed so you can learn the basics. This is a low risk/low cost way to learn the basic skills and see if earthbag building suits your needs. $10/sq. ft. is difficult to achieve unless you do most all of the work yourself, have almost no codes, use local and recycled materials, and choose a small, simple design. Our earthbag guesthouse cost about $11/sq. ft. and we were eager to demonstrate how earthbag building can be low cost. We bought new bags, had our soil delivered, bought nice new fixtures, etc. so it would look nice. On the other hand, I didn’t want to spend loads of time looking for recycled bags when we only needed 500. So what I’m saying is you have to decide what your time is worth — is it worth your time to save a few extra dollars? It’s a personal choice each person has to make. on March 8, 2012 at 7:05 pm Jennifer H.
I absolutely love this plan! 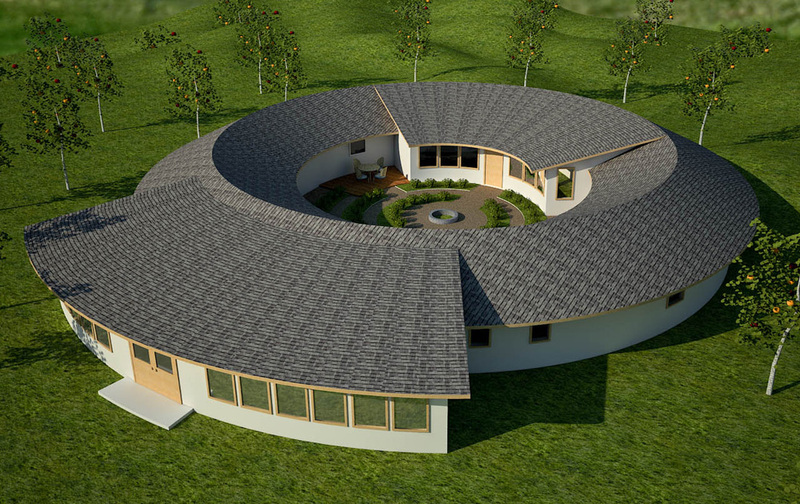 I am talking to someone right now about plans for an “earthship,” but they are so expensive! 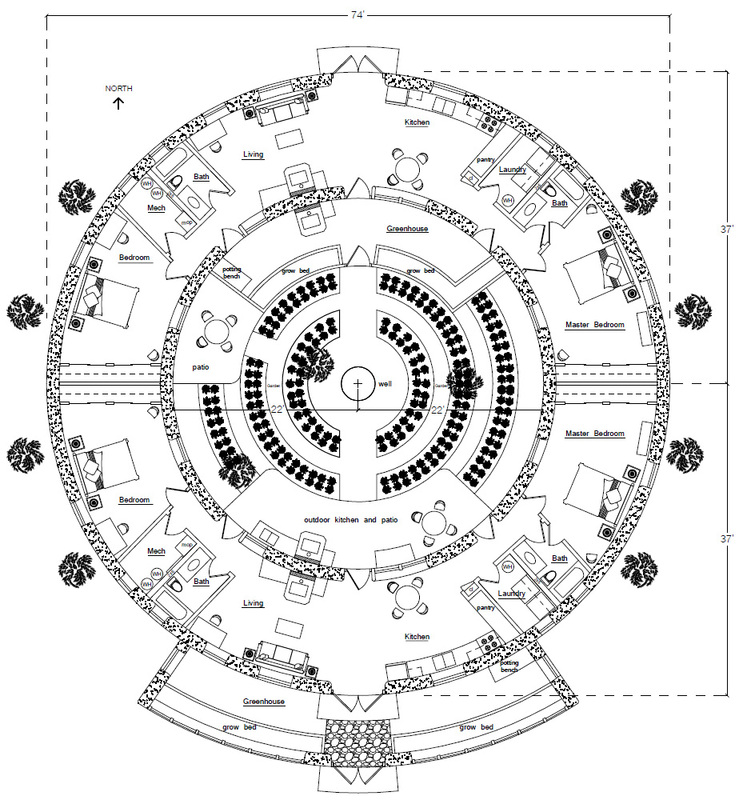 Earthships appeal to me because they are off grid and very temperature regulated. They claim that utilities cost $50-$100/yr. Could the Torus be made to be off grid (bermed, water catchment, grey water routed to the plants, no need for an air conditioner, etc.)? We live in southeastern Oklahoma where the summers are hot and humid and the winters have the potential to get pretty cold. I’d have no need for two kitchens, laundry rooms etc., but I do have a growing family/ home business that could use the square footage as well as a proclivity for family/ friend gatherings that last a week or more. Could the north side of the house be bedroom/ office space instead? What about a berm on the north side as well? Has a Torus been built to your knowledge? I am also interested in all the “options not shown” for reasons stated above, storage for the food I’ve grown, and the fact that we live in tornado alley. As a novice to building, I worry about electric and plumbing not being included in the plans. Is there a reason for this? I know I have a lot of questions, but I am so anxious to build! I have land and zero building codes to adhere to. I would start today if I had blueprints and materials! Anyway, I love what you’re doing and so admire your work. Thanks! The short answer is yes to everything. Email me at strawhouses [at] yahoo.com for details about ordering a custom plan. I like the Torus design, but I noticed on another blog post you mentioned the earthlodge would not be good in a hot humid climate like Texas. I live in central Texas. Would the Torus work in this area? Could it be built in phases? If Torus is a good design for my region, I plan on emailing you to get the additional information to take it off-grid. Yes, this would work well in your climate if you extend the roof overhangs, put the porch on the south side and maybe make some other small changes (window type, maybe 9′ ceilings). My email is at the top of this page under About Us. The Torus Design is quiet wonderful ! We would like implementing an EcoFarm project in the rural area of the Delta of Saloum (Region of Fatick, SENEGAL, West Africa) in 55,750 m² of land. It will take the shape of an agro ecological experimental farm with demonstrative stations intended for education and training within applied alternatives, One of the main objectives of this project is to reduce the pressure on the continental natural resources and the coast, creating at the same time income-generating activities (AGR) for the local communities thanks to the agro ecology concept of the project integrating a sustainable tourism. So with the Torus Design we only need one kitchen, a restaurant layed out up to the patio and the other areas available organised to receive only bedrooms with private bath. In addition we’ll need a set of five Double Unit Ecoresorts. We ‘re also expecting to implement a Two-Bedroom Earthbag Roundhouse with Open-air Deck in another area of 24m X 45m. Build the roundhouse first (or some other small structure) to develop your skills. Welcome! What about the “Earthbag Lodge with Domes” ? I found it to-day while getting deeper in your different sites. I’ll send you an email as soon as possible and tell you a little more about the project that I would like to incorporate into the “Accueil Paysan” network which is already present in Senegal with an ongoing program with a partnership “Accueil Paysan Poitou Charente – Regional Council of Fatick” for a period of three years (2011-2013). So It would be a good example of pilot project for sustainable, fair and responsible tourism..
Would it be reasonable to make the Torus a two-story-high structure? Or would that reduce the sun to the courtyard to an unhelpful level? Or make the house less green / sustainable? I’m not ready to order plans but curious about options. Yes, that’s possible. I’ve already completed one two story version of this design. The client wanted an inner balcony and staircases. It worked okay except this takes up lots of space away from the courtyard. Also note, going two stories means moving heavy materials higher up on the wall. So one story buildings are more efficient when using heavy materials (unless you have special machinery). Good points… Thanks for the info! I’m definitely planning to contact you when I have a place to build something on! Would there be a way to earthberm using polyethelene umbrella and have the courtyard as a greenhouse dome? My Wife and I are in the planning stages for retirement and this has a lot of the ideas I’ve been thinking of using. Very nice design. Yes, that’s possible. The only drawback is the somewhat limited space inside. You couldn’t grow a giant garden. Also note, this is a large structure and so you’d need help. It’s best to start on a small tool shed, etc. to build up your skills. Help isn’t a problem. I have a family full of masons and other construction as well. The issue I have most is no architects, which is hopefully where you can come in and save the day when it comes time. Thanks for the input, time to get deeper into the planning! I’m available for consulting by the hour. My email is at the top of the page. I love the house, I will be contacting you a little later for design. I also only need one kitchen, laundry etc. What I do need is functional, economical, green retreat for 100% Disable American Veterans, like a 5 master suite type home with a interior corridor to family and kitchen areas. We actually want to build 2 of these one in Oklahoma with it’s milder winters and the other in Colorado. Of course the one in Colorado will probably cost twice as much, but the summers are not as intense as Oklahoma. I love all your ideas and it has been difficult choosing a design, keep up all the great work. You are extremely helpful. We are a family of three and want to purchase land and build our own earthbag home. Last night we sat and drew out our ideal home and my version was almost exactly like this. I really appreciate the link to building codes as well. I will email you for further info. Thank you so much. Can a flat slab concrete roof be put on earthbag walls…ie.. will the walls be able to support the weight? Yes. As you can read on our Testing page at Earthbag Building.com, earthbag walls can carry 10x the load of wood framed walls. The slab roof could be designed so a bond beam is not needed.